Check out the video teaser from our 2011 show in Chicago. …TAKE IT OFF AT THE PARK WEST! 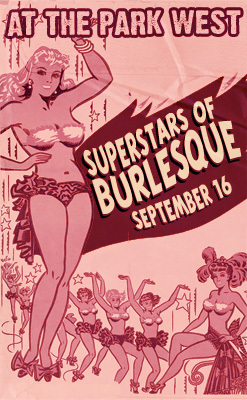 Get ready for the most action packed, teasingest, pleasingest burlesque spectacular ever staged! For the second year in a row, Studio L’amour presents “Superstars of Burlesque”, the most ambitious and spectacular burlesque show ever to hit Chicago. But this year it’s EVEN BETTER! For ONE NIGHT ONLY, the world renowned Superstars of Burlesque take the stage with their titanic talents to bring even more heat to your August night. The best burlesque performers in the world will be there. EVERY PERFORMER IN THIS SHOW HOLDS A TITLE FROM THE BURLESQUE HALL OF FAME (the industry’s highest honor). Scheduled to perform are Michelle L’amour (2005), Indigo Blue (The Reigning Queen of Burlesque 2011), Dirty Martini (2004), Roxi D’Lite (2010), Julie Atlas Muz (2006), Kalani Kokonuts (2009), The Stage Door Johnnies (World’s Best Group – 2011), Trixie Little and Evil Hate Monkey (World’s Best Burlesque Duo – 2006 and King of Boylesque – 2010), Tigger! (2006), Hot Toddy 2009), and The World Famous Chicago Starlets (THE WORLD’S BEST BURLESQUE TROUPE – 2010). Hosted by Mr. Showbiz – Murray Hill. This remarkable event will take the stage only at Chicago’s Park West on September 16, 2011.